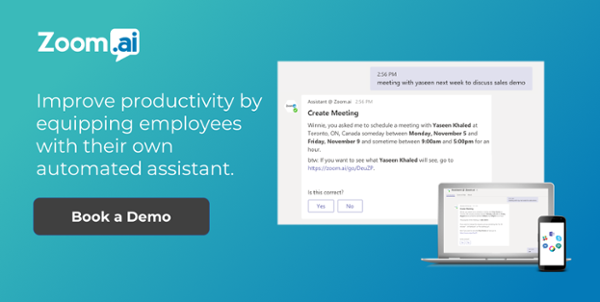 The latest Zoom.ai feature lets you set up recurring reminders in your calendar so that you can stay organized in your workday. Once connected to your preferred calendar, your automated assistant can add reminders in directly into your calendar. It will also send notifications to your favorite chat platform to make sure you don’t miss your reminder. Just like with one-off reminders, once the reminder is added, it will appear in both your calendar AND in-chat or via email (depending on your preferred settings here). The reminders will appear in your calendar but will not appear as “Busy” and will not block the time slot. Please note that we don’t currently support reminders that recur more than one day per instance. For example, you may put in “remind me to work out every Tuesday”, but not “remind me to work out every Tuesday and Thursday”. Automating your recurring reminders is just a few clicks away. Message your Zoom.ai assistant today to get started.